I needed something that was going to be easy to make but would also be slightly different on the table when we hold our Macmillan Coffee Day next week. 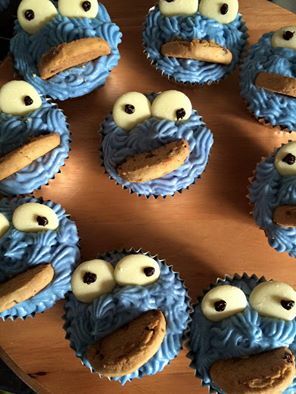 My friend suggested these Cookie Monster Cupcakes. They were very easy to make with just a usual sponge cake then iced with blue buttercream. 2 Milky Way buttons for eyes and half a cookie stuck into the mouth. I look forward to hearing what The Sweetpeas say about them when they are home from school. Oh my goodness - they are amazing. Think that's my Sunday sorted! oh they look so good and remind me of when i made a giant cupcake in the shape of cookie monster for my sons first birthday and i shed much sweat and tears over it til midnight lol. The kids are so adorable! And this is such a great money making exercise for kids. I only my mom would have done that to keep me in proper clothing when I was young. Great idea!